"Luke Boone doesn't know exactly what his uncle Rust is involved in but he wants in on it-the cars, the money, the women. And it looks like he's finally getting his wish. When Rust hands him the managerial keys to the garage, they come with a second set—one that opens up the door to tons of cash and opportunity. Though it's not exactly legal, Luke's never been one to worry about that sort of thing. Especially when it puts him behind the wheel of a Porsche 911 and onto the radar of gorgeous socialite named Rain. As Clara drifts deeper into the luxurious lifestyle of Rain, and further into the arms of her very attractive and charming target, the lines between right and wrong start to blur, making her wonder if she'll be able to leave it all behind. Or if she'll even want to." 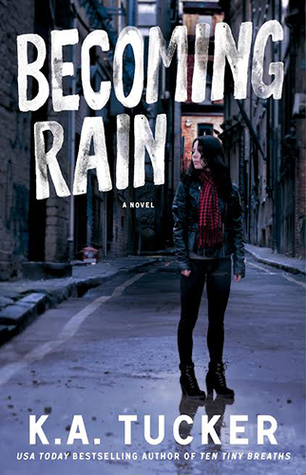 As my wonderful friend Michele of A Belle’s Tales said in her review of Becoming Rain, “K.A. Tucker puts the “new” in New Adult” and I could not agree with her more. This series truly stands out in the genre. The writing is gorgeous and the characters are so perfectly flawed. It’s the kind of book you want to savor. I’m going to start off with Luke. I was worried about Luke because I didn’t completely love him in Burying Water, but boy did he grow on me. I felt so bad for Luke, but at the same time I wanted him to open his eyes. He just followed blindly and I knew it wasn’t going to be good. Then we have Clara and she was another one that grew on me. She was so tough at first and I struggled with her snap judgments, but then I really came to love her. She is a strong one and it was so hard watching her struggle with what she was doing. I enjoyed seeing Jesse and Alex again. Although I did get anxiety every time I thought someone was going to drag them into Luke’s mess. My claws came out at those moments. I needed them to be left alone and happy! The thing I did struggle with though in this one is the anticipation. This is a long book and a majority of the book is anticipation. You start this book off knowing that things between Luke and Clara is built on lies and then you spend the entire book waiting for it to come crashing down. That build up nearly killed me. In both good ways and bad ways. I think I got a bit impatient at parts knowing that things between Luke and Clara were going to blow up. And then I just wanted a bit more at the end; just a tad bit more of the after. Becoming Rain is a book that will have your stomach in knots wondering how it will all work out in the end. Another great read from K.A. Tucker. This sounds like a book that'll make you bite your nails down to the skin! But anticipation sounds both good and bad... all in a good way! I do need to finally start this one, but I've been reading so many contempts, all I've wanted to read lately is fantasy. So hopefully I'll start this one soon! Amazing review, my dear friend! I've been like that too! I just want fantasy and paranormal! Oh, it takes that long for things to get resolved?! Idk if I could take it, lol. I agree- I also wanted a bit more after the fallout, lol. I agree- the anticipation was hard, and I hated that feeling in the pit of my stomach that it was all going to hell. Haha. I really ended up enjoying this one and fell completely in love with Luke!